Really kicking myself for not picking up that pink zome delica. 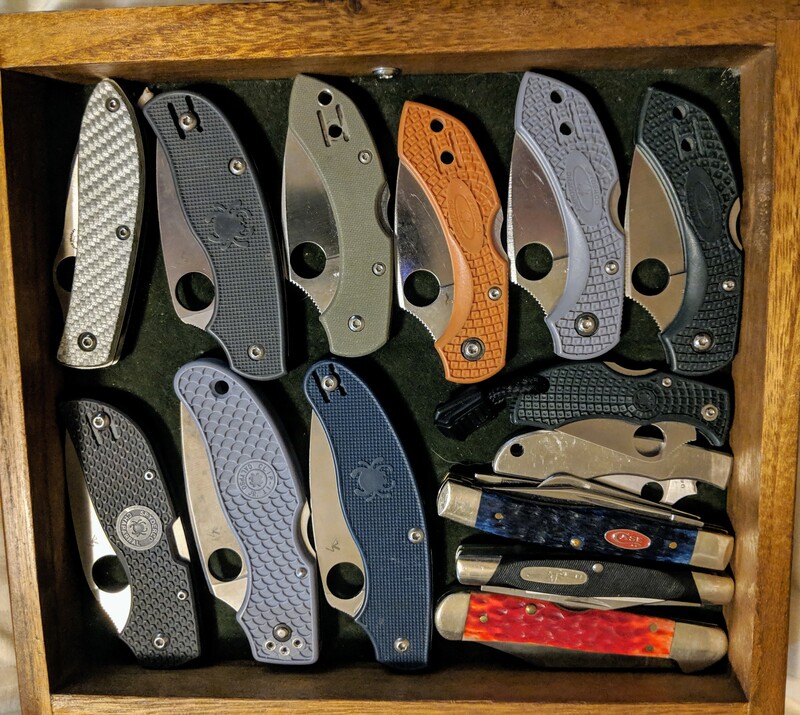 I've never had a Spyderco only drawer. Some are missing. 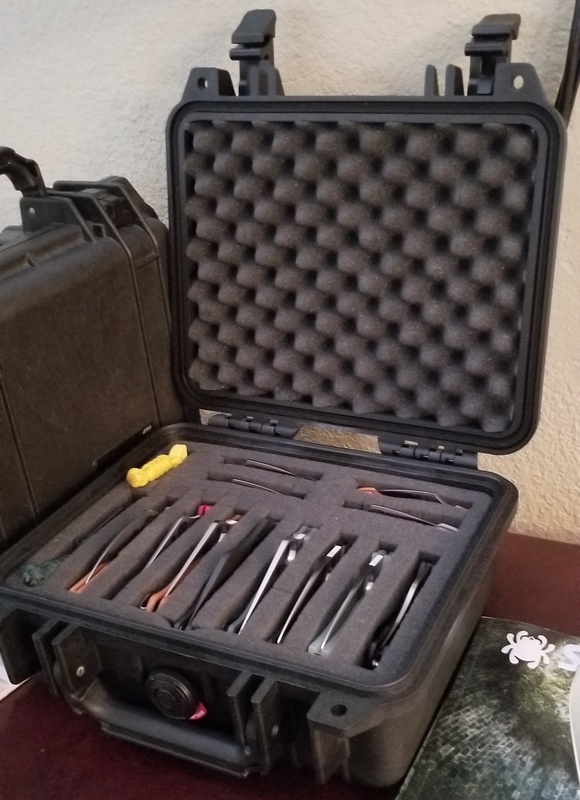 My izula 2 and hatchet are still in my overnight pack, etc. I too, prefer using stands instead of cases. I like being able to see them, out in their glory and making the difficult decision each morning on which to carry. 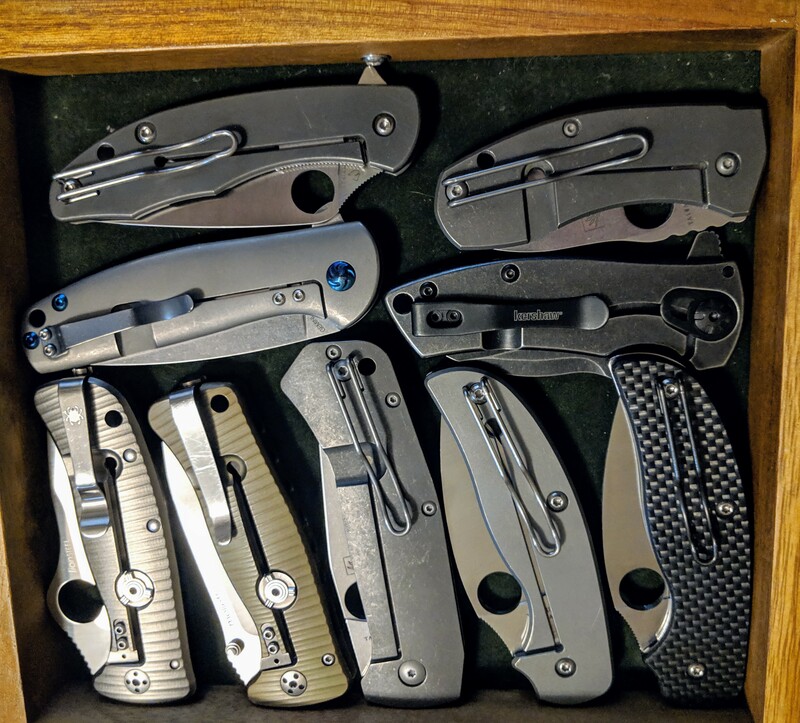 This doesn't include my "beater knives"
I have debated on a different type of case though as my stepdaughter is getting older and having friends over playing, I'd hate for any of them to wander into my workout/knife room and cut themselves thinking my knives are cool or something. And one of those is a hawkbill ladybug. I though about doing the drawers separately, but I figured I'd try at getting everything in a single shot. 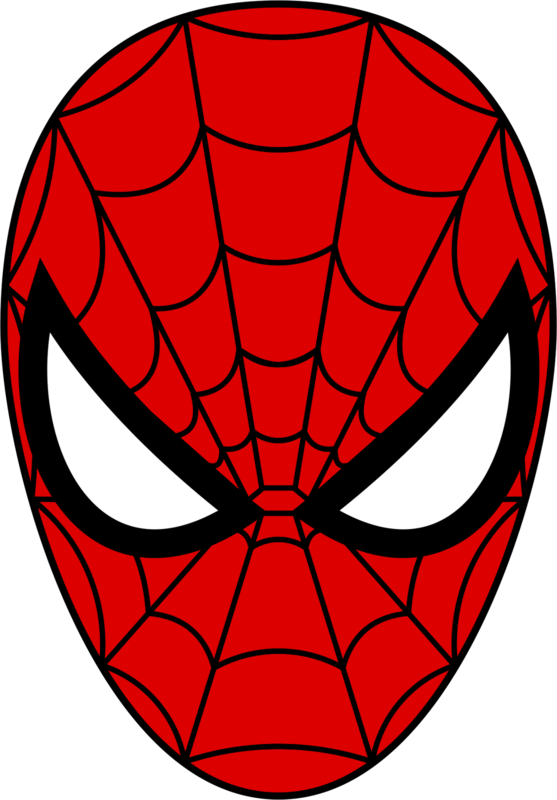 If anyone is interested, I could try and make some individual photo's when there's daylight. Just a tip - That pesky logo rubs right off with some nail polish remover. Ask me how i know! Me too. It was sitting in my BHQ wishlist while I was shopping for the other kids’ knives. My two oldest picked the pink zome and the teal, both of which at the time I didn’t realize were limited runs. C’est la vie! Picked it up for my daughter; ended out keeping it for myself. Here's most of my drawers! My small clip less knives. These are carried daily as I am in slacks at work. DF2 is my favorite. But I do enjoy the others greatly as well, particularly the Chaparral. 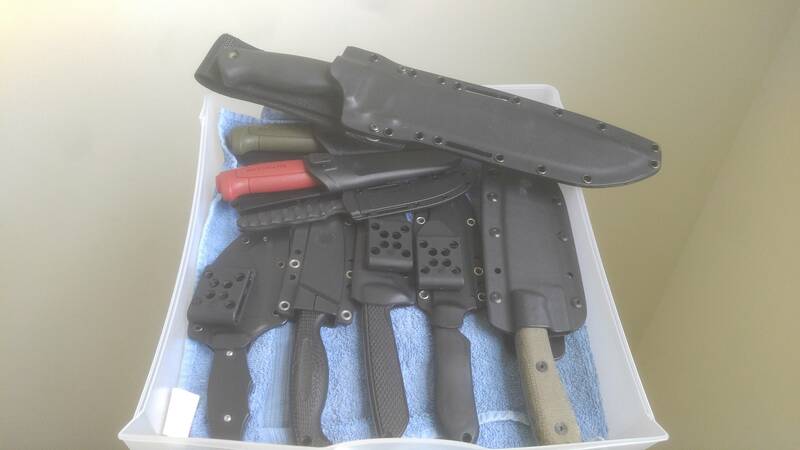 Medium knives, Delicas and Calys (mostly). Delicas were my first Spydie and still have a definite soft spot for me. But these aren't carried as often. 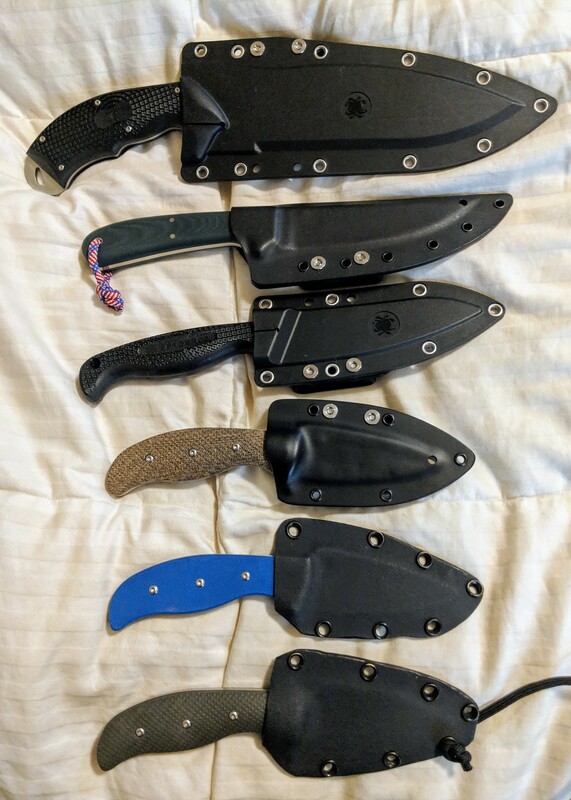 Remaining FRN knives. Like the Endura more than I thought I would. And really like the Hungarian. Most of my Framelocks. Favorites are the Techno and the Mantra. 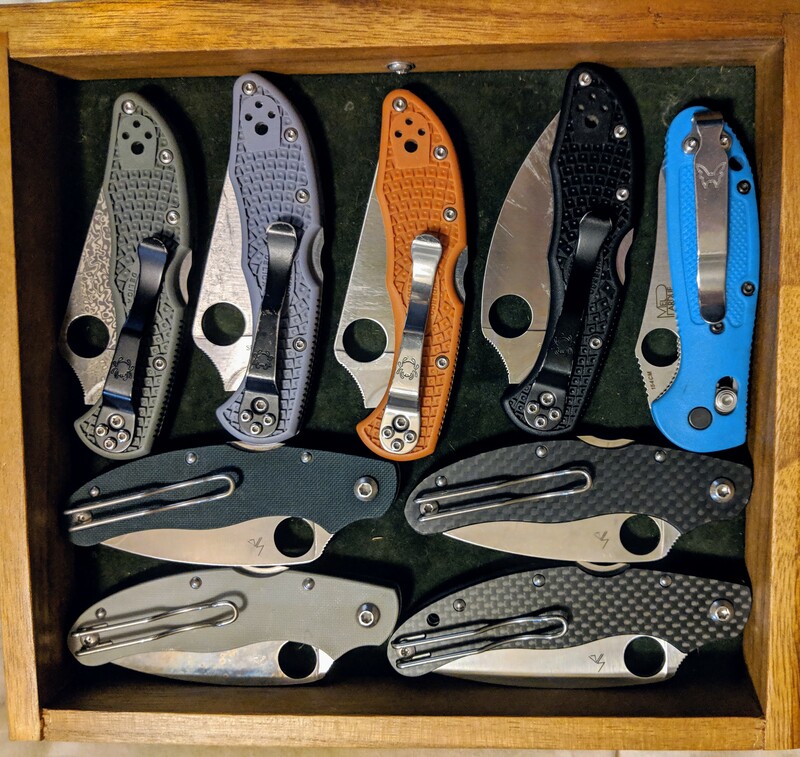 Mixed drawer. Enjoy the P3s and the original GB. Natives just don't fit my hand really well, so I should probably get rid of those. 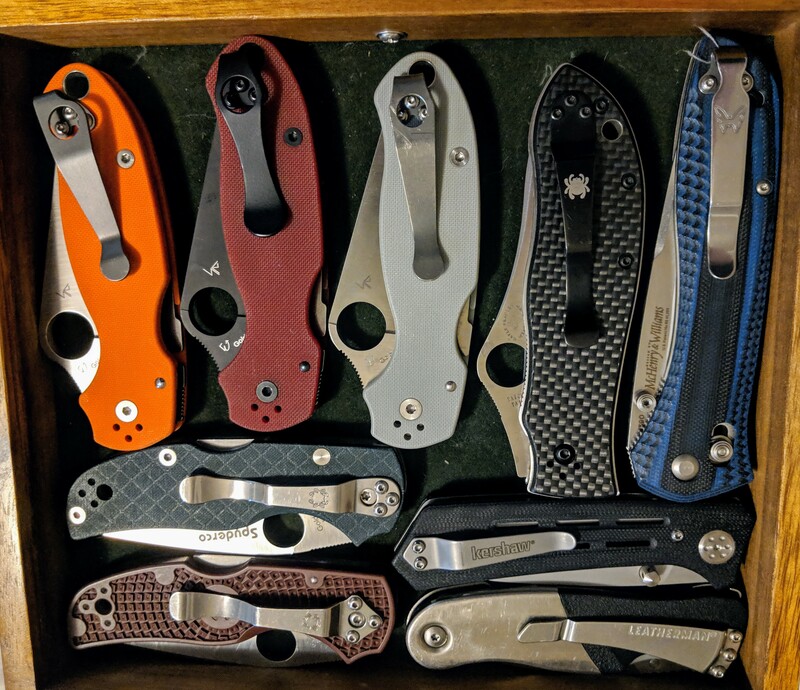 Overall, the PM2 and Military is my favorite model. 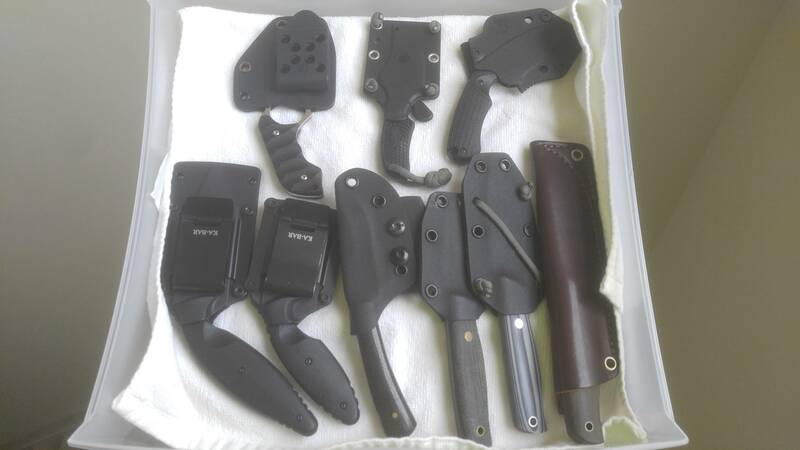 Only one missing here is my BHQ M4 model which is getting ready for a dunk in the Rit Dye tank. Favorite PM2 is the Rex45. 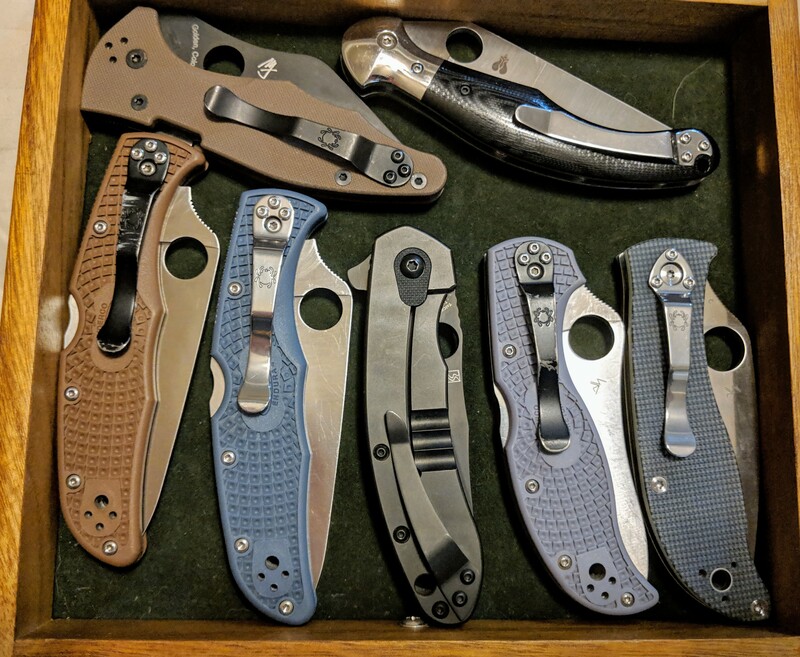 Favorite Military is the 52100, or the 204P, or the Ti/CF S90V... At this point, I don't prefer the Manix 2 XL or the K2. Should probably get to selling those. There's a lot of custom work and colours you're not seeing in this picture. 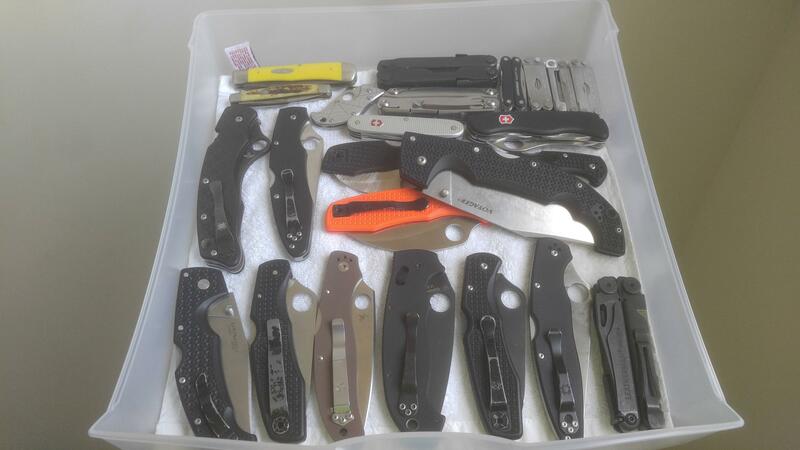 Seeing all these fixed blades and threads about them is starting to make me consider one...I just don't want to fall down the rabbit hole like I have with folders! After seeing this I am not feeling so bad about all my purchases now. Did you guys keep your boxes? I do. Will pull some from the safety deposit box and post some pics later.